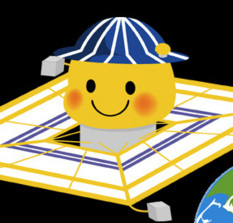 This news is a little old but worth mentioning: On September 9, the Japanese solar sail mission, IKAROS, won a Web award in Japan for their work to publicize the mission via Twitter. The Google translation of the particular award they won is the "Anxious people Web award" but I was told that a more accurate translation is "Remarkable" rather than "Anxious." "Ikaroskun," the Twitter persona of the Japanese solar sail mission IKAROS, was awarded this medal in the 8th Web Creation Awards. I found out about this on September 29 when suddenly my Twitter feed was filling up with Japanese text, a conversation between the Twitter personae of the IKAROS spacecraft and its two deployable cameras, DCAM1 and DCAM2. I had no idea what was going on, but fortunately Twitter not only provides confusing Japanese text but the means to find out what it's all about. I Tweeted a request for help and an explanation, and several people replied to explain that the DCAMs (or their Twitter personae) were "interviewing" the IKAROS spacecraft about the mission so far, in celebration of the Web Creation Award during the awards ceremony, which took place on the 29th. Here's the whole text of the interview in Japanese, complete with the ever-changing cartoony avatars for the spacecraft and little cameras. The very same day, I was surprised and pleased to receive an email from a reader, Masanori Watanabe, who provided a translation of the text. He made many apologies for the quality of his English but I think the translation is fantastic because he attempted to preserve the tone of voice of the three participants in the interview, and also explained several subtleties of meaning that would be clear to a Japanese person but are opaque to us outsiders. It's a wonderful little window into the different way that this successful Japanese space mission has endeared itself to the public. A few words of explanation before I begin with the translation: IKAROS-kun means, I think, "little brother IKAROS" -- IKAROS' Twitter persona is that of a boy, full of enthusiasm, junior to the older and more experienced Hayabusa ("Hayabusa-niisan," elder brother Hayabusa) and Akatsuki Venus orbiter Twitter personae. IKAROS-kun speaks about another Japanese mission, Michibiki, as "Micchy" below. 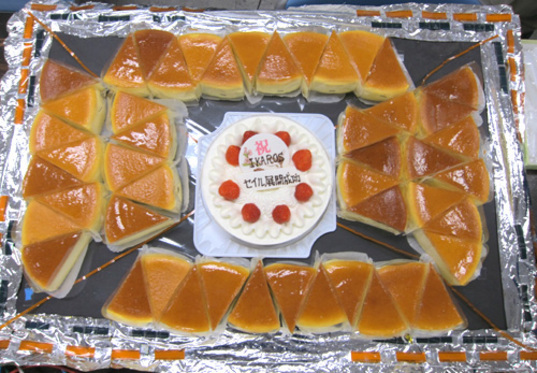 Likewise, "Usuda-san" and "Ucchy-san" refer to the Usuda and Uchinoura Space Center deep-space communications radio antennae. The deployable camera DCAM1 is portrayed in this conversation as "DCAM1-chan," the elder sister of DCAM2-kun. In reality, both DCAMs lasted only about 15 minutes after their deployment until their batteries failed, at which point they "went to sleep" on Twitter. So the "interview" below takes place after they have been "sleeping" for a long time. Text in parentheses means that they are talking in their sleep. Avatar for "Ikaroskun," the Twitter persona of the IKAROS mission. IKAROSkun: Oh? Someone spoke in a sleep? IKAROSkun: Oh! The ceremony is today! Thaaaanks. 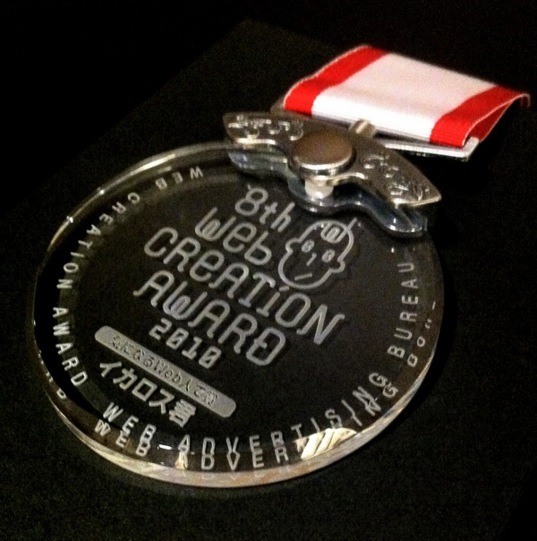 IKAROSkun: An award called Web something-or-other. IKAROSkun: Seems our chatting about what happens here in space from myself, DCAM1-chan, DCAM2-kun have worked well! IKAROSkun: Let's dress up for the ceremony! Even cannot attend on Earth. IKAROSkun: I have chatted a lot because I feel glad when chatting with Earth and everyone. A bit surprised because it ended up with receiving this award! IKAROSkun: But in the beginning I was asked not to chat too much by people who made me, to say the truth. IKAROSkun: An award for the candidate who was voted most from general public. IKAROSkun: Ummmmm. They say it's about 1500. Feel so happy for being supported by such large number of people, don't we. IKAROSkun: Yes! Thank you everyone for your suppoooort!! IKAROSkun: They say this is the first time for Web Creation something-or-other to give their award to spacecraft like me, instead of human being! Sounds great. IKAROSkun: This is the award for not only myself but for us three. It's because you two have been my company to chat with during this trip. IKAROSkun: Right! Together with you two since Sagamihara. IKAROSkun: We and Akatsuki-kun have been next to each other since we were in Sagamihara. When boarded on the rocket, we were below Akatsuki-kun. IKAROSkun: His ceramic thrya.... thruster was as close as I could bite. IKAROSkun: Since before left Earth Hayabusa-niisan taught me much about space and encouraged me always. IKAROSkun: Thanks to him, I have felt no fear in space. I worked hard to show Hayabusa-niisan myself with my sail spread out. IKAROSkun: He happened to end up becoming a shooting star... But it's because of him I am flying like this now with no problem, isn't it. IKAROSkun: And Micchy who had been in the next room when in Tanegashima, is now in space and working hard to be one that can guide people on Earth! IKAROSkun: The two who are still flying together near me as I think everyone knows! Thanks for taking pictures beautifully of my whole figure with my sail spread out! IKAROSkun: Usuda-san and Ucchy-san! Since the day I left Earth I can chat with Earth because any of the two receives my voice. IKAROSkun: Yes! I sent them perfectly. People say it's beautiful pictures and we were praised so much! IKAROSkun: Left Earth on 21st May.... started spreading my sail since June. I spread it with myself spinning 25 times per minute so got dizzy. IKAROSkun: Finished spreading my sail on 9th June and sent many kinds of data to everyone on Earth. Succeeded for the first time in the world, we were praised so much! IKAROSkun: Praised by Hayabusa-niisan, too!! IKAROSkun: After that, the one who worked hard first was DCAM2-kun! IKAROSkun: On 14th June you left me and took pictures! Thank youuuuuu. IKAROSkun: Next, DCAM1-chan worked hard on 19th June! By leaving me slowly you took many pictures of me, and also succeeded to take a picture of the shadow of yourself. IKAROSkun: experiment with VLBI, too! IKAROSkun: And then while flying with pressure of Sunlight, people on Earth have been measuring and checking many things about me! IKAROSkun: They say that by doing it they could learn if I am moving by Sunlight as expected! IKAROSkun: Although the distance with Alatsuki-kun would be getting larger little by little, I am heading towards Venus like him. IKAROSkun: Thanks to my sail, it seems I will pass Venus on outer course than Akatsuki-kun. IKAROSkun: I will do my best to fly as far as I can! IKAROSkun: No, impossible for you, too! IKAROSkun: Seems someone from Public Affairs Department attend it on behalf of me. IKAROSkun: So I will send my message and ask the person to read it. IKAROSkun: Someone, please bring the award certificate etc to here in space! IKAROSkun: For people on Earth are excellent, someday they will make our little brother and bring it to me! IKAROSkun: Oh, I agree! Then, let's take pictures of me again. Celebrating successful sail deployment with a cake! IKAROSkun: OK. I may ask them to bring cheese cake, too?! IKAROSkun: Ah, I want to drink HFC-134a, too! Comfortably warm one, please. IKAROSkun: My trip will last. Follow me by my side. Everyone on Earth, please keep on supporting me! IKAROSkun: Ah, they fell asleep again. IKAROSkun: Thank you very much for your support this time really! Because of your support, I can work hard and I could receive such an award. IKAROSkun: As my respond to expectation from everyone who support me, I will fly farthest as I can! IKAROSkun: People who made me, people who operate me, I would like you all to keep taking care of me, please, during the rest of my journey too!! IKAROSkun: Thank you very much really, everyone who support me!! IKAROSkun: Phewwww. I chatted a lot. IKAROSkun: DCAM1-chan, DCAM2-kun, thank you. IKAROSkun: It's a secret that I was actually measured by ranging during chatting. IKAROSkun: I have to work hard on sending data in my data recorder from now on!